Mani Wonders Inc. of colorful aluminum wallet, Cascade is an introduction. Unibody design of, from a single aluminum machined, sturdy and fresh impression while being excellent durability is a product of charm. In the order of magnitude of the credit card, the thickness only 10.3 mm. If with cover, standard card until seven can be stored. (Please refer to the cover column.) In addition to comfortably accommodate the 8 cards. Because the RFID protection, it is safe. This wallet colorful selling, you can choose from five colors. In addition three types of trim finish (jet black, chrome, Rose Gold) Choice finish of your choice from. The body of the chamfer already cascade, polishing processing is given, should that can Which also had positive feedback choose the color your satisfaction.Property: Cascade, using the button again, there is a feature in the card insertion mechanism that cascade fashion to be able to breathe a breath. 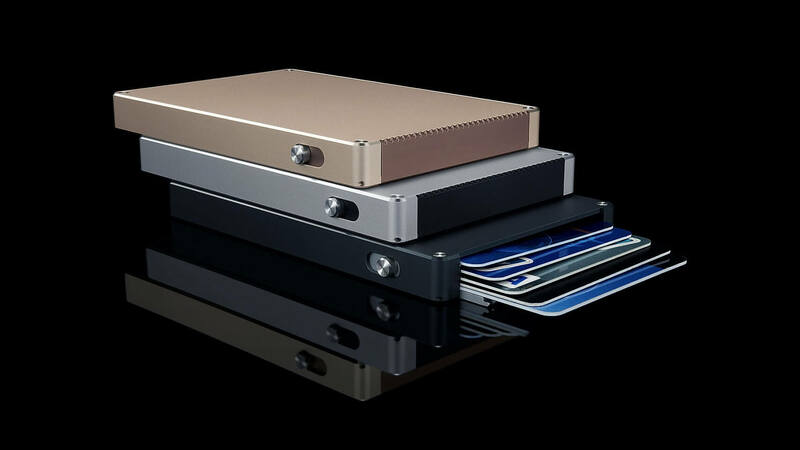 Manufacturers, There is also the fact that familiar items that wallet anywhere, at any time it is possible and out of the card, has led to incorporating the present cascade unique characteristics to shine with the package the day-to-day life. In addition, manufacturers use their own snap clip, bill storage and of, such as can also be clipped to the business card. In silicon contact pads, it is safe so firmly to secure the item of clip. Cover: Important documents and point card class, and the bill stacking. Easy travel storage of not need effort. Cover is made of matte polyurethane leather, with microfiber lining. It will be offered at five of complementary color. In addition, the cover seamlessly to fit the cascade wallet, in order to firmly protect the around the cascade, can be carry more of the items safely, very convenient.